I spent the last few weekends in Toronto. Highlights included martinis at Pravda with my dear friends Mireille and Patrick; Indian food with some of my favourite former colleagues; an outdoor Back to the Future screening in Liberty Village with Humber PR gals; and decadent high tea with my old roommie Steph at the Royal York. Classic moment from Back to the Future. The Tweed Ride. Only in Toronto. Whenever I’m in the city, I can’t help weighing life there against life in Elmvale. Some things about Toronto are just amazing. Some things, erm, less. As JF and I drove up the 400 yesterday afternoon, we discussed both. When we got home, we decided to clear our heads with a walk through Tiny Marsh before tackling our long list of chores. 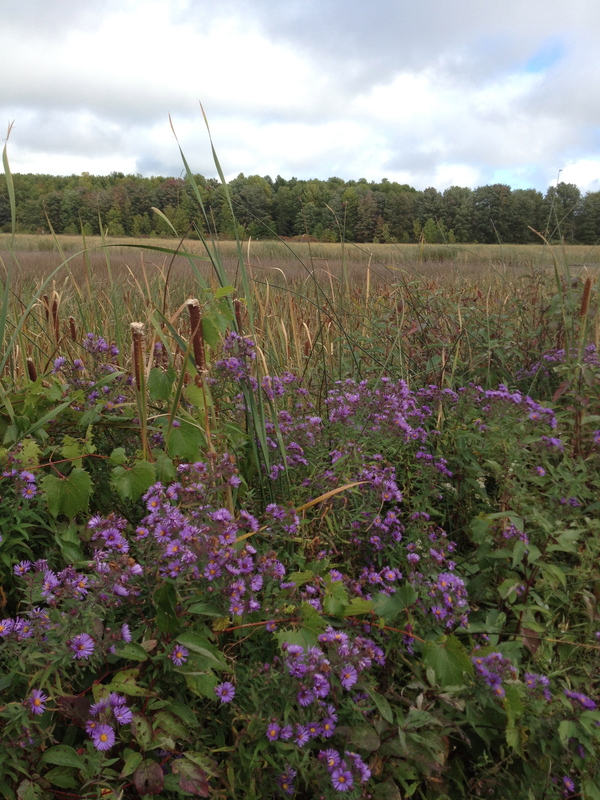 Tiny Marsh is starting to show its fall colours. While quietly plodding (so as not to upset the birds) I remembered this blog post from a year ago. Not surprisingly, most of the list is still accurate. But I feel differently about a few things. So here it is, revisited — original thoughts in italics, new thoughts indented. This is still the toughest part of being in Elmvale. Barrie’s good sushi offers a view of the highway. But at least it exists! It’s expensive, but again, available! Surprisingly, we’re both gainfully employed. So I don’t miss this anymore. Yishey gave me a big, giant box so I’m set for at least a few more months. Thanks Yish! Don’t know why I put this on the list in the first place. NOTE: We have excellent local farmer’s markets that are cheaper. If only they sold cheese and bagels and eggplant parmesan. As in LGBTQ — there isn’t enough of that here. There are tons of corners and nooks in our new neighbourhood, they’re just plant-filled instead of building-filled. I must truly be a country bumpkin because I don’t have the urge to do this anymore. At first, I thought our local media outlets were slow. Now I realize they just don’t have as much news to report. I don’t find I need pumpkin spice lattes anymore — weird! I’m adding a new one: the wide variety of amazing restaurants and shops. Barrie just doesn’t come close. Another new one: cool stuff happening everywhere. Like the oddly appealing Tweed Ride — in which historically-attired hipsters ride their vintage bicycles through town. The number of perfectly-groomed people per square kilometre in Toronto is so indimidating to me. See my post about commuting in Simcoe County. I won’t cross this off, but I will say I miss not driving on a Saturday night. In the summer, this is true. In the winter, it is not. So I’m half crossing it off. After months of tight-knit Elmvale, this was kind of nice for a weekend. But I wouldn’t want to live in it forever. I finally understand why hordes of people descend on Yorkdale every weekend: Anthropologie, J. Crew and Tory Burch. Truth: for all my diatribes against eating out, sometimes I kinda miss this. Surprisingly, I missed his antics after awhile. Springwater politics are dull. Wishing him and his family strength. There are probably more fans per capita in Elmvale than in Toronto. Ugh. Not sure why this was on my list in the first place. I rarely used the PATH. It’s good for me to think about these things from time to time. To enjoy my Toronto time, while I’m there, and appreciate Elmvale’s Elmvaleness. This entry was posted in Country vs City, Love, Family and Friends, Uncategorized and tagged Blue Jays, city mouse, country mouse, Country vs City, Elmvale, Maple Leafs, Matt Galloway, Rob Ford, Toronto, TTC, Yorkdale Mall by Mikaela Lefaive. Bookmark the permalink. Nice Mikaela! Now I’m questioning my return to the jungle city after being in PEI again this summer. Good luck with that one, Mikey! Tough call!